In package manager console execute: Update-Package –reinstall Newtonsoft.Json. If you still get an error after doing this, then what worked for me eventually is that I deleted Json.Net's <dependentAssembly> section from my .config file. Reinstall brings it back if it's not there and apparently you need to delete it. Until there will be a normal solution in the package itself, I'm afraid this manual step is a must. Note: Please read the comments below before doing this. As per René's comment below BE AWARE that the command posted in the answer will reinstall the package in every project in your solution. So if you use the Newtonsoft.Json package in several projects and maybe use different versions, just executing the above command might have unwanted consequences. IMPORTANT: Check that the configuration tag of your config file has no namespace attribute (as suggested in https://stackoverflow.com/a/12011221/150370). Otherwise, assemblyBinding tags will be ignored. The key point is referencing right version in your config file. 3- Add dependent assembly to your config file as it should be.. The -force option in the first command is required to force the uninstall. Dependencies with other assemblies prevent the uninstall without it. Double check the .Net version of every project that's in your solution. Just right click on project and go to Properties. If possible set the same .Net version for all projects. If not at least try to change the Startup project one (for me this was the one causing the issues). Remove all Newtonsoft.Json packs from the solution. Remove the Newtonsoft.Json assembly from the project reference and add it again. You probably deleted or replaced the dll by accident. I was writing a WebApi REST service client, so for me this error was caused by adding References to the System.Net.Http and System.Net.Http.Formatting assemblies manually via Add Reference, when I should have added the Microsoft.AspNet.WebApi.Client package via NuGet. See also this answer to another question. 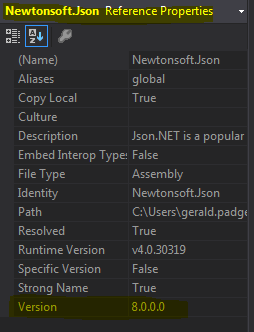 This is telling you that the assembly loader found a different version of the Newtonsoft.Json assembly, that does not match the reference you created in your project. To load the assembly correctly, you must either deploy the assembly side by side with your compiled code, or install the correct version of the assembly in the destination machine (i.e. in the GAC). If you want to keep the current solution, and load an assembly with a different version, make sure that the configuration you posted is in the correct .config file. Remember that there is no xpto.dll.config, a DLL loaded by an application always uses the config file of the running application. Normally adding the binding redirect should solve this problem, but it was not working for me. After a few hours of banging my head against the wall, I realized that there was an xmlns attribute causing problems in my web.config. After removing the xmlns attribute from the configuration node in Web.config, the binding redirects worked as expected. We had the exact same issue that you mentioned. We're using nunit to run tests through CI, and we have nunit running a file called tests.nunit, which describe a list of test dll fixtures to run. Each test fixture had their own config file, but when run through the "tests.nunit" file the binding redirects seem to be ignored. The solution was to add the binding redirects to a new config file, "tests.config" that was beside the "tests.nunit" file. In my case, the main project was still referencing an old version of Newtonsoft.Json which didn't exists in the project any more (shown by a yellow exclamation mark). Removing the reference solved the problem, no bindingRedirect was necessary. I had the exact same problem with version 7.0.0.0, and the lib causing my problem was Microsoft.Rest.ClientRuntime which somehow was referring to the wrong version (6.0.0.0) of Newtonsoft.json, despite the right dependency management in nugget (the right version of newtonsoft.json (7.0.0.0) was installed). ----> After a few days without changing anything it came up again with the same error. I installed version 6.0.0.0 n updated it to 7.0.0.0 it works fine now. In my case, after downloading the assembly and adding the reference to the project, I solved this by 'unblocking' the DLL before adding the reference to the project. Using Windows explorer, browse to the DLL location, right-click on the DLL and then select 'properties'. You'll find an 'unblock' button on one of the tabs and then you can add the reference and the assembly will load correctly. I made the mistake of adding a NewtonSoft .dll file for .Net 4.5. My main project was 4.5, but when I added an extra project to my solution, it strangely added it as a .Net 2.0 project... and when I attempted to use NewtonSoft's 4.5 dll with this, I got this "Newtonsoft.Json couldn't be found" error. The solution (of course) was to change this new project from .Net 2.0 to 4.5. Execute the following command from "Package Manager Console"
I was facing the same error and struggled with it for hours. I had a web API project which is using Newtonsoft.json and another UnitTest project for the web API project. The unit test project also needed the Newtonsoft.json reference. But on adding the link I was getting the above exception. Another insidious problem is that it appears that binding redirects can just silently fail if the element has an incorrect configuration on any other dependentAssembly elements. Ensure that you only have one element under each element. Took me a long time to realise this was the problem! Not the answer you're looking for? Browse other questions tagged asp.net json.net or ask your own question. Why is Newtonsoft.Json so prone to assembly version conflicts?